Left foot forward (a journey into reenactment): Baptism of fire. So I left the house in the thin morning light, in kit, sack thrown over one shoulder, with a journey from Brighton to Nottingham ahead. First fail: My connecting train had been cancelled. Fortunately myself and another chap at the station agreed to share a taxi to Brighton and both got our trains okay. Going up in all the kit I had was a practical matter (and quite fun) as I also had a sackful of stuff to carry and didn't want to take a full change of clothes. A useful thing here was a leather wallet on a string I picked up, you will need to put your tickets, money, phone and cards etc in something that can also be concealed whn required. I had booked an early train although the Saturday was mainly a setting up day for a display on the Sunday and bank holiday Monday, so when I got off the train (leaving the gang of medical/law students on a stag weekend whom I had shared much of the the voyage with, they were like a pack of junior British officers going on leave, football, cricket, drink, rugby, drink etc) I had some time and looked at Nottingham castle, had a drink in ye olde trip to Jerusalem, allegedly Britain's oldest pub and made my way towards Woolaton which lay on the outskirts of Nottingham, so googlemap told me. I also had 'that' conversation for the first time with a very nice chap when we both got caught in a sudden downpour, 'Why are you dressed like that? Why Napoleonic stuff? and Why French? I had memorized the route, roughly, as I realised even with my phone put away when in camp it was unlikely to hold battery life for 48 hours, later I would buy a spare battery and swap it when the first ran low). A couple of people thought I was a pirate and a man with a big moustaches shouted Vive le France! out of his van. I arrived. I found the French campsite by Woolaton hall (which you might recognise from Batman) and met Duncan and a couple of others, the first to be putting up tents. Then had a sit down, refilled my canteen and had more of the dry bread and sausage that would become my staple fare. More folk arrived. The Flag went up. 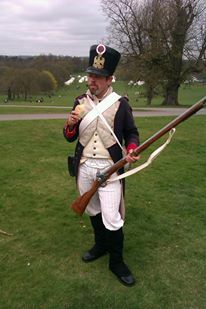 I borrowed the habit, giberne (cartridge belt) shako and musket that would complete my kit. Beer cans cracked open. I felt very welcome, chatted here and there. Then it was off to the pub for dinner. The backroom was soon full of Frenchmen and women whilst quite coincidently some American WWII reenactors appeared in the main bar, visiting the place where the unit they portray had been billeted. Local people were all very interested. Back at camp I crashed out under an awning. For several reasons I had no tent (I was kindly offered a plastic tent and an option of sharing but declined), firstly I didn't feel I'd need one, secondly I couldn't afford a proper one and thirdly it would have been a great bundle to carry, also I liked the idea of being a Soldier with his gear on his back and that a tent would have been a bit of a luxury often left behind on the march, if available at all. I slept quite well and awoke at dawn, seeing a stag and hind just standing there in the morning mist. I am very proud of this picture. First time fully kitted up in the French camp, away in the background you can see the British camp, where they deserve to be at the bottom of the hill! Drill. I was a bit worried, drill always seemed complicated and visions of Private Pile from Full metal jacket came into my head. Everyone would be well drilled like a military machine and there would be me struggling to turn the right way as commands were given in French. It was fine. I made a few mistakes but new guys are put in the back row and always with someone at hand to help, plus much of it is just copying everyone else.. I mainly listened to a gauche or a droit.. for a clue as to which way we would be going. After this me and a few new or out of practice guys got a go on our own, enough to be able to get by in the event that afternoon. Firstly we had to be in an artillery display showing the effect of different shot on a body of men, lots of falling down and dying involved. We got a nice big BooOOOooo as we came on. With only twenty minutes till the skirmish we fell out under some trees, it was lovely waiting for the off and making small talk, wondering what would happen. After an artillery duel we came on and the battle drifted back and forth, I stood in line, second rank and (pretended) to aim and fire, timing my shots with the real shooters around me, smelling the smoke for the first time. Time goes quite quickly, and even standing waiting to go forward is exciting, your world is primarily the people immediately besides you. The French side had the best of it that day, red and green coats lay strewn about the field and we marched back up the hill to our camp. I was going on holiday the next day and after a bit of chatting and handshaking was on my way back to the station, having had a great weekend.